Honeycrisp Apples Farm Fresh to your door or store! "The balance between sweet and tart utterly seduces your taste buds"
Honeycrisp Apple - Order Online - Direct From The Orchard! 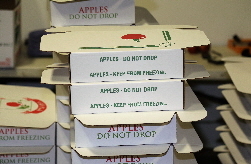 Honeycrisp apple, McIntosh apple, Gala apple, Cortland apple, Macoun apple, Red Delicious apple, Fuji apple, Fortune apple, Empire apple, Stayman apple, and Winesap apples in gift boxes, farm fresh. Apple in a gift box for your Mom or a trailer load to your store! Shipping Honeycisp Apples and other varieties, fresh from the farm... to your door! Supporting our troops with "Operation Apple"
Since 1999 we have supplied Honeycrisp online and in stores. Our Honeycrisp apples can store three to four months in the refrigerator. Apples & Pears from late August till June of each year. Honeycrisp Farm fresh apples delivered to your door! Have you tried Pink Lady? or Cameo? It is a Mutsu or a Crispin? Senshu too! McIntosh like when you were a kid. Fortune Apple the Northern Spy X Empire cross. Cortland apples are great for pies! Macoun Apple New England favorite!. Got Honeycrisp Apples? We do! Granny Smith apples for Pies or fresh eating! Honeycrisp apples will store in the fridge for up to 4 months. The Honeycrisp apple sweet/tart taste combined with the Crunch in every bite is what makes Honeycrisp apples the most popular. The popularity of Honeycrisp apples is shared both by adults and children alike. This apple person has never seen teenagers so excited about an apple as Honeycrisp apples. Even Macoun apple lovers are switching. just a little further north and colder they are a whole lot better. Red Delicious Apples as well! Fresh from the Farm. Honeycrisp Apple trees grow best where it is the coldest! Our goal at EC Marketing is to deliver to the consumer the best apples in the world and now our all new Chocolate products. We especially pride ourselves at working with some of the most outstanding “Explosively Crisp® Honeycrisp” growers of all time. We deliver tractor trailer loads to the supermarkets or a gift box of Honeycrisp to your mom, always fresh from the farm! Honeycrisp apples can store up to 3-4 months in your fridge. Honeycrisp is fast becoming the most popular apple. 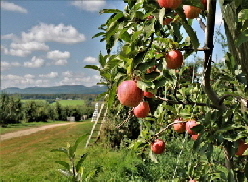 Our Honeycrisp are grown in Upstate New York along Lake Champlain.. Honeycrisp make the perfect gift and will surely make you knew friends. Adults think Honeycrisp are great and Kids thing they are awesome!